← Yury Kasyanov: The premonition of a great war. By Semyon Semyonchenko, Commander of the volunteer Donbas Battalion, representative of the “Samopomich Association Party” [“Self-Reliance”]. Yesterday the CEC [Central Election Commission] declared me an elected MP of the Verkhovna Rada of Ukraine [Ukrainian Parliament]. I thank the people of Ukraine for their great confidence [in me]. 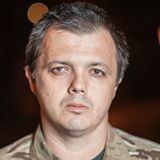 I am not a soldier, I’m passing the reserve service of the National Guard of Ukraine [NGU] and am a reservist who does not receive payment for their service. Currently, the Donbas battalion holds combat coordination for their service in the area of the ATO [anti-terrorist operation]. I, as the battalion commander, will do my best to prepare reservists to perform their duties. In this crucial and difficult time for the country where there is a real threat of aggression, it is my duty to be with the Donbas Battalion in the area of the ATO. This entry was posted in "Voices" in English, English, English News, War in Donbas and tagged #Donbas Battalion, #RussiaInvadedUkraine, #Semyon Semyonchenko, #UkraineUnderAttack, Samopomich Association Party, Ukraine. Bookmark the permalink.